Foreign Affairs Minister John Baird and British Foreign Secretary William Hague will sign an agreement to open joint U.K.-Canadian diplomatic missions abroad in an effort to extend each country's diplomatic reach while cutting costs, CBC News has learned. Hague told CBC News, "as the Prime Minister [David Cameron] said when addressing the Canadian parliament last year: 'We are two nations, but under one Queen and united by one set of values.'" "We have stood shoulder to shoulder from the great wars of the last century to fighting terrorists in Afghanistan and supporting Arab Spring Nations like Libya and Syria. We are first cousins." "It is natural that we look to link up our embassies with Canada's in places where that suits both countries. 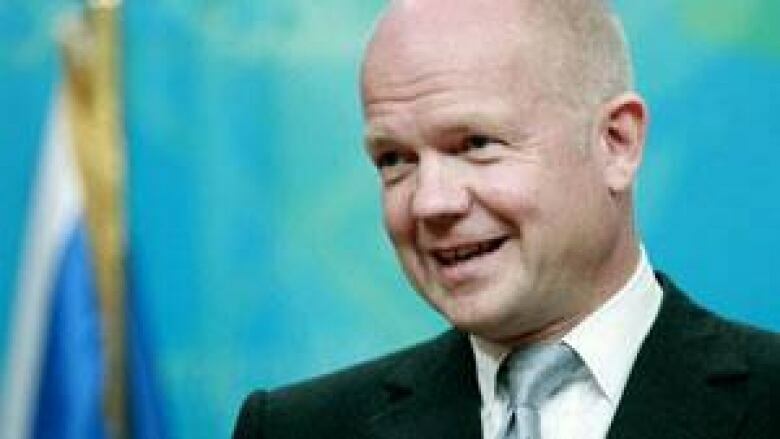 It will give us a bigger reach abroad for our businesses and people for less cost," Hague said in a written statement. The arrangement is being described by a senior Canadian government official as "out-of-the-box thinking that modern diplomacy requires." "At a time when governments around the world face more demands for their foreign investments than there are funds, collocating with our most trusted allies and making the most of our shared resources makes perfect sense. It increases our diplomatic reach in a cost-efficient way." But NDP foreign affairs critic Paul Dewar is raising questions about the deal and whether the government's cost-cutting measures will compromise Canada's independence and its foreign policy. "I think it has a lot to do with the fact that this government is cutting severely on diplomacy," Dewar said. "And its priorities on diplomacy and multilateral institutions has waned." Dewar added that the deal "is a convenient way to one, cut the department of foreign affairs in our diplomatic reach. Two, to make it sound like it is something that is a natural thing... a strategic thing that we should be doing." Is sharing embassies with the U.K. a good idea? Take our survey. However, Gar Pardy, a former head of Canadian consular services, told CBC News in a telephone interview that sharing diplomatic and consular services with other countries can work in certain instances, even save the government a considerable amount of money. For example, Canada has already been providing services to Australia in 26 locations around the world and vice-versa for years and that, according to Pardy, has saved the Canadian government "hundreds of thousands of dollars." With respect to this particular joint deal, Pardy said he is "surprised" because the U.K. has been trying "to get out of providing those services for other countries because they found it costs them money." According to Pardy, "the key to it will be the functions that will be performed under such an agreement." Fen Hampson, who is with the Centre for International Governance Innovation (CIGI), an independent, non-partisan think tank on international governance, worries these cost-cutting measures will have a negative impact on Canada's image around the world. "This is not the time to be cutting corners in how we sell ourselves... We're seen as a country that has managed our economic affairs, we're seen as a leader, we're seen as independent of the U.S., independent of the U.K., and this is the moment where we should be selling Canada on our own and not doing it with others." In reference to Hague's statement, Hampson said "it sounds like we're first cousins, but first cousins don't always live in the same house and Canada has very different interests from those of the United Kingdom." "To me this is penny wise, pound foolish diplomacy, both literally and figuratively. This is the very moment when we should be investing in our diplomacy," Hampson said. The British Foreign Secretary hopes other Commonwealth countries like Australia and New Zealand will join the Canada-U.K. iniative so they can pool their resources and extend their reach abroad. While Baird would not comment on the details of the deal itself, a spokesperson for the minister of foreign affairs told CBC News that Baird and Hague will be available to answer questions from the media on Monday afternoon in the Foyer of the House of Commons. The Conservatives, in the last budget, said they would restructure Canadian government offices, foreign properties and missions abroad "to provide better value for money and results for Canadians." Should Canada and the U.K. share embassies abroad?